Conscious Discipline was created by Becky Bailey, and is built on the premise of developing discipline within children rather than applying discipline to them. 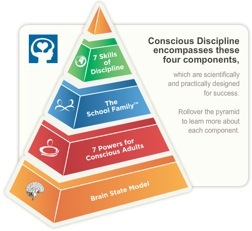 The Conscious Discipline process is made up of four components, the Brain State Model, the Seven Powers for Conscious Adults, The School Family, and the Seven Skills of Discipline. For ease of understanding, it can be pictured as a pyramid. The Brain State Model resides at the base of the pyramid. It becomes a frame for us to understand the internal brain-body states that are most likely to produce certain behaviors in children and in ourselves. Therefore, the Brain State component provides the foundation in which the three other components are built upon. Seven Powers for Conscious Adults is the second layer of the pyramid. Once you have an understanding of the brain states, you then need to become familiar with and wholeheartedly believe in the seven powers along with their mission statements. The School Family is the next layer of the pyramid. With an understanding and acceptance of the previous two layers, you can easily begin to implement the Conscious Discipline classroom structures along with connection tools such as I Love You Rituals. Seven Skills of Discipline is the fourth and final layer. With a mastery of the previous three layers, the seven skills will give you the tools to successfully guide your students to discipline themselves from within rather than being disciplined from you.